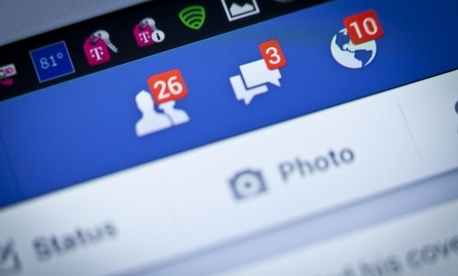 Which Facebook Friends Can Help You Land a Job? For the eight million people in the U.S. who were searching for work in April, knowing which types of social ties are most likely to be helpful is useful information. Who is more likely to help you land a job? Your close friends you talk to all the time or someone you see occasionally while lifting weights at the gym? A person’s social network is made up of many social ties, and each tie is of varying strength (a close friend is a stronger tie and an acquaintance is a weaker tie). It makes intuitive sense that a strong tie might be more helpful because that person might know you better and be more willing to refer you to an employer. On the other hand, a weak tie might also be useful because that person could offer you novel information about job openings. In a recent paper , my co-authors and I used data drawn from millions of Facebook users to determine what kind of ties actually are most likely to lead to a job. Should job seekers focus on networking primarily with their stronger ties, or is it a better use of their time to cast the net as widely as possible and make sure even the most distant Facebook “friends” are aware they’re hunting for work? In our paper, we measured tie strength either as the number of times two people interacted over a year on Facebook in tags or posts or as the number of mutual friends they shared on the social network one year before a person started a new job. In the U.S., 54 percent of adults have a Facebook account , and Facebook interaction is a good predictor of real-world tie strength . It follows that a tie is weak if the two individuals have very few interactions or very few mutual friends. Using these tie strength measures, our key findings show that a user is less likely to eventually join the same workplace as a friend considered a weak tie than a strong one – suggesting closer friends do in fact make a big individual difference in finding a job. But collectively , most jobs come from “weak” friendships because such relationships are far more numerous. Let me explain what we did to reach these conclusions, and then we’ll see if we can answer those questions I asked at the outset. the user and the friend were Facebook friends at least one year before the user started working at the shared employer. We restricted our analysis to U.S. users and friends (age 16 to 64) who listed employer information, some education and who had been on Facebook for at least one year. That left six million individuals and their friends, for a total of 260 million dyads (pairings). Of these six million users, about 400,000 had a “sequential job” – that is, they at some point worked with a preexisting social tie. From these 400,000 users, we created a random subsample of about 1,200 and then connected them back to all their friends. That gave us about a million dyads. We then counted up how many jobs were transmitted from the weakest ties (that is, those that had no tags, posts or mutual friends in common). Next we counted up how many jobs came from the slightly less weak ties (1 tag, 1 post or 1 mutual friend). And so on and so forth. This figure shows the proportion of friendships that are characterized as being weakest to strongest. The green bars are just friendships between a person who got a job (transmitee) and the friend who helped them (transmitor). 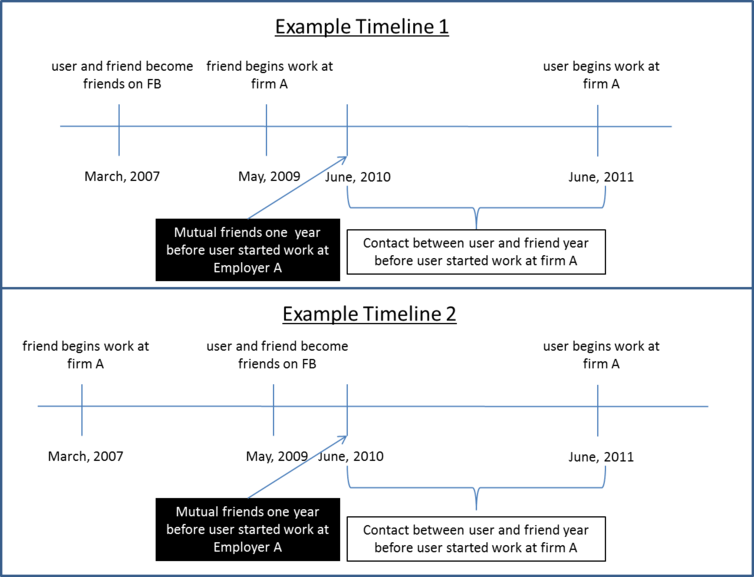 The clear bars are friendships between a person who got a job (transmittee) and all their friends, both helpful and nonhelpful to job finding. We took that information and created a diagram of these transmitee/transmitor pairs (at right) to show which friends were most likely to lead to jobs. It turned out that most jobs came from the very weakest ties (no tags, posts or mutual friends). After doing a similar analysis on all friendships (even those that didn’t lead to a job), we found that most Facebook friendships are very weak. In other words, most jobs come from our more distant “friends” because most of our Facebook pals are very distant. To illustrate this, consider the following hypothetical: what if I told you that most jobs come from friends who have brown eyes? Well that means that people with brown eyes are collectively more helpful than people with other colored eyes. Does that also mean that an individual friend with brown eyes is more likely to be helpful than an individual friend with, say, blue eyes? Probably not, so we need to test for the individual probability a friend will be helpful, not just the collective probability. Recall that weak ties might act as bridges that convey novel information. This suggests that weak ties could be individually more helpful than strong ties. For example, a weak tie might be an old pal from college you run into at a reunion who tells you about an open position at her company that you would have never heard about from your regular friends. That is how weak ties could be individually helpful, because they might have new information for you. Not exactly. We found that people who are likely to end up working together are also likely to be strongly tied to each other and that, individually, the weak ties aren’t as helpful. To isolate this effect, we used control variables to rule out a few possible issues like (1) strong ties may be similar in age, and some employers only hire younger people, (2) strong ties may be more likely to go to the same prestigious schools and some firms only hire from those schools, (3) strong ties may be more likely to live in the same city and some firms only hire from certain cities. There are a few other things we were able to rule out (such as how being an extrovert might make you more likely to have many strong ties and get a new job). After all our careful checking, we still found that the probability that any single friend is helpful is highest for the very strongest ties. So how about the idea of strengthening a tie, by, say, getting reacquainted with an old friend? Is that more likely to lead to a sequential job from that friend? 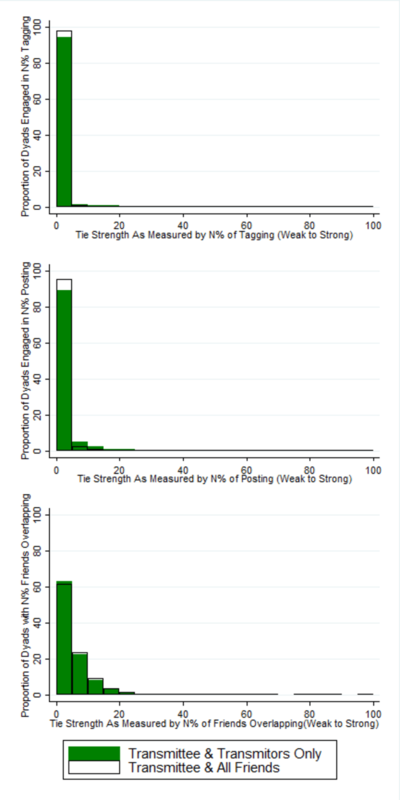 We used some mathematical modeling to see if increasing tie strength (by adding an extra tag, post or mutual friend) improves the odds that the user and friend will eventually work together. We found that an increase in tie strength is in fact associated with becoming co-workers some day. So if you’re looking for a job, what can you learn from our research? The answer, as it often is, is it depends. Stronger ties may be most likely to put in the extra effort to help you get a job. At the same time, you never know which of your distant “friends” may have the hot tip about a departing colleague, which means collectively, just because there are so many more of them, these weak ties matter most. Does that mean you should forget your best buddies and focus on expanding your social network as far and wide as possible? Technically, since our paper uses preexisting networks, it tells us only who is more likely to be helpful both collectively and individually in your preexisting network. That means we can’t make any broad statements about making new friendships. At the end of the day, when you’re looking for a job, it’s best to pursue every path possible, which means making sure your strong ties are helping you out and the weaker ones are aware of your search.